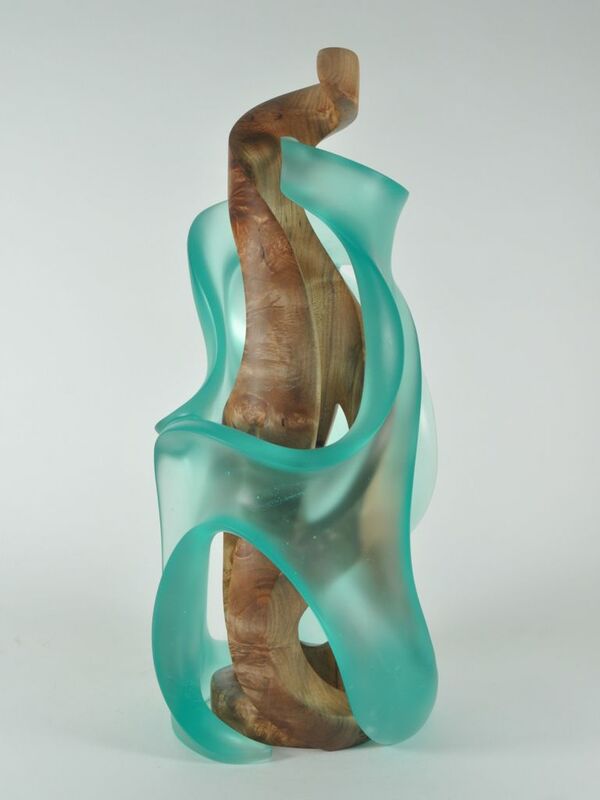 Pollitt completes wood and glass sculpture commission — the Challenge. When I create, I block out the world. Listen for a soft inner voice. Perceive a stirring that in turn compels action. Once materialized, the piece seeks out its soulmate (aka: Collector) to enrich another life. And the cycle is complete. Commissions, then, are a total reversal. The voice now comes from the outside world. It is usually general in nature, nonspecific, incomplete in detail, but trusting that their soul will commune with mine. And so this was my “commission challenge.” To do a double medium (wood and glass) sculpture-in-the-round. Others have encouraged me to do this and, after much reflection, I had concluded that it could not be done. But destiny has a way of seeking you out. Faced with doing what I deemed impossible, I was nearly paralyzed with terror. Then, little by little, images and forms began to emerge. On the third maquette (small scale rough draft in wax), I struck the right form – a sculpture within a sculpture. Yes, both pieces complete and distinct in their own right, but combined and “nested.” They augment each other – with the whole greater than the sum of the parts. I would not have done this on my own. I am grateful for the challenge and trust placed in me. I am better for the experience. Plus, a new avenue for creative expression seems to have emerged. Thank you to my Collectors! Genesis. The name seemed natural. First there was wood. Then there was glass. Now there are both. These few work-in-progress photos can’t begin to convey the myriad decisions involved in creating this piece. The glass had to have numerous and large “windows” to reveal the inner wood sculpture. Design parameters resulted in a mere two inch difference in the diameters of the two sculptures. And, because I needed at least 1 ½” of glass to sculpt dramatic movement and character, I was left with just a 1/4” gap all the way around in the interior. Finally, of paramount importance, the glass needed to be precisely the right color and density to create the desired ethereal effect. Then there was the wood. Choosing the right species of wood took a lot of time and experimentation. Too dark, it absorbed too much light. Too light and it got “lost” in the glass. A mid-tone, highly figured, somewhat reflective wood was needed. Maple burl turned out to be just right for creating a distinctive contrast between the sculptures. In the end, the viewer sees the wood through the openings and its ghosted outline behind the solid glass. This draws the eye in and out to capture the true essence of the entire work as well as the individual structures. Just a wax cylinder with a few design lines for GLASS sculpture. First look (in wax) at the nesting concept…GLASS over WOOD. Finished wax ready for GLASS foundry. Finished wax provides model for eventual WOOD sculpture. Finished WOOD sculpture, with bolder facets than wax model. GENESIS by Harry Pollitt. 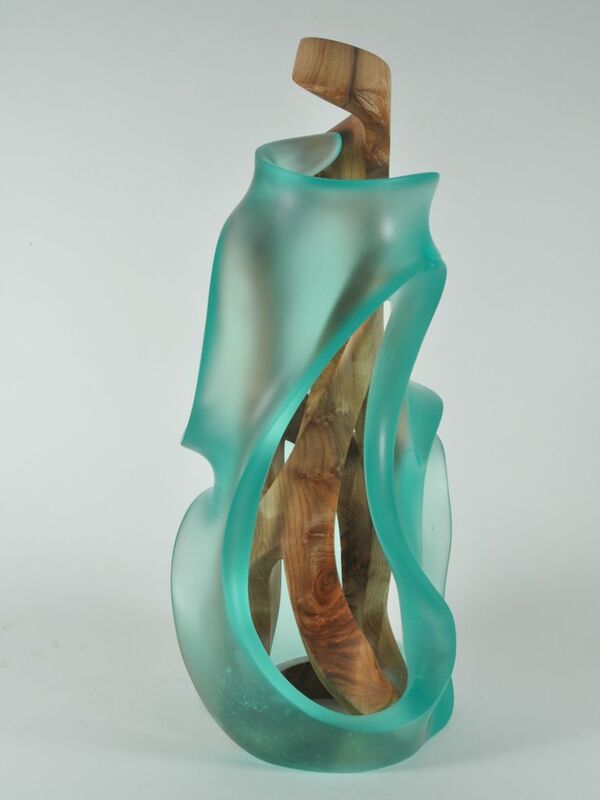 Cast Glass entwines Maple Burl sculpture. GENESIS. A sculptural dance of cast glass and highly-figured wood.